Andi Carter has gold fever! Someone near town has struck it rich. Now Andi can't stop wondering if there might be some of the glittery metal in the creeks on the Circle C ranch. Her brothers agree that she might find something that sparkles. But they laugh whenever they talk about it. Andi is determined--when she finds gold, she'll be the one laughing! Her friend Cory is excited to track down treasure too, and together they set off on an adventure. Panning for gold is cold, wet, tiring work. But Andi and Cory won't give up. Success! Just when they discover what they're looking for, real trouble shows up: a spring storm, a missing horse, and a frightening bear. And those are just the beginning. Andi Dreams of Gold is the fifth installment from Circle C Stepping Stones series. 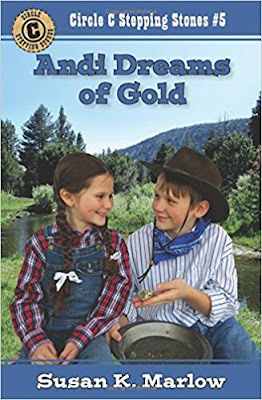 This time Andi finds herself in trouble by looking for gold with her friend, Cory. The story made my daughter giggle and we both enjoyed their adventure. A good story to teach children lessons and inspiration. Andi and her family are good role models for readers. I give Andi Dreams of Gold five stars. Highly recommended for young readers 7-10 years old. Andi Far from Home is book six from Susan K Marow's series, Circle C Stepping Stones. 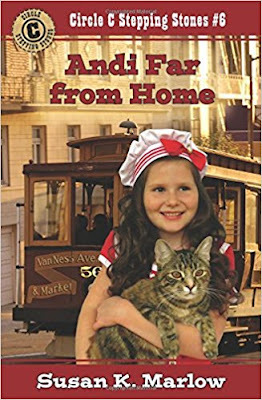 In this installment, Andi has to be sent away to her Aunt Rebecca's house in San Francisco, California, because of a scarlet fever outbreak in her home town. She has quite a bit of an adjustment going from the ranch to the big city. As usual, she gets into some trouble. Andi Far from Home is my favorite of the series so far. I give it five plus stars. This series looks so cute!